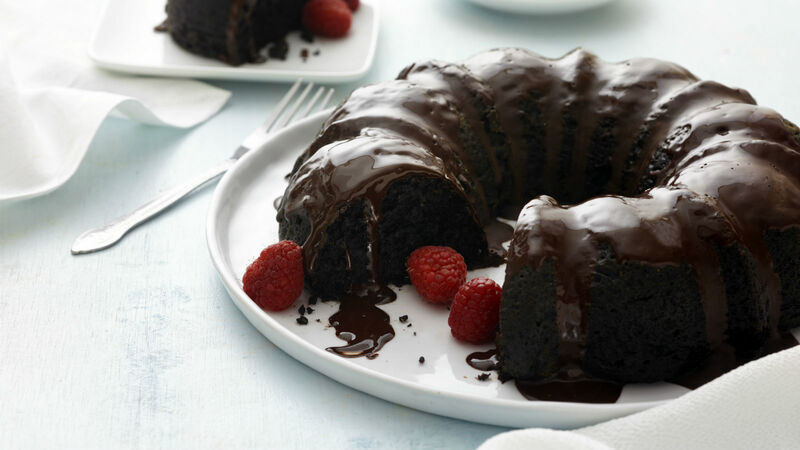 A moist and delicious chocolate cake that is dairy-free, gluten-free and Passover friendly. I had heard the myth of chocolate cakes made with cooked quinoa and didn’t quite believe they’d actually be tasty. This cake is surprisingly moist and delicious—great for Passover and all year round. Note: This recipe is gluten-free, dairy-free and Passover-friendly. You can make this cake up to three days in advance, and it also freezes well. This recipe is excerpted with permission from Paula Shoyer’s cookbook The Healthy Jewish Kitchen. Place the quinoa and water into a small saucepan and bring it to a boil over medium heat. Reduce the heat to low, cover the saucepan, and cook the quinoa for 15 minutes, or until all the liquid has been absorbed. Set the pan aside. The quinoa may be made 1 day in advance. Place the quinoa in the bowl of a food processor. Add the orange juice, eggs, vanilla, oil, sugar, cocoa, baking powder, and salt and process until the mixture is very smooth. To make the glaze, melt the chocolate in a large microwave-safe bowl in the microwave (see above) or over a double boiler. Add the oil and vanilla and whisk well. Let the glaze sit for 5 minutes and then whisk it again. Use a silicone spatula to spread the glaze all over the cake. A Passover dessert that's confoundingly light and rich. A simple and satisfying side dish to enjoy during Passover or anytime.